André de Montbard served as the 5th Grand Master of the medieval Knights Templar from 1153 AD to 1156 AD (during the 2nd crusade). Montbard was the second and last founding member of the order to serve as Grand Master, after Hugh de Payens. Montbard was also known for being the uncle to St. Bernard of Clairvaux who was a champion for the Templar order and wrote the Rule that governed the order. André de Montbard is believed to have been born sometime around November of 1097 in the family castle in the Burgundy region of France. He was the son of Bernard de Montbard and Humberge de Tonnerre d'Angoulême. The Montbards were vassals of Count of Champagne as was Hugh de Payens. This same Count was also the one who donated the land to St. Bernard where the abbey of Clairvaux was established (the early Templar order was a very interconnected affair). Little is known about Montbard's life, but it is known that he was in the Holy Land around the time the Templar order was established as he is mentioned to have carried letters from King Baldwin II and St. Bernard of Clairvaux. From 1148 to 1153, Montbard served as Seneschal (second-in-command for the entire order). The previous Grand Master, Bernard de Tremelay, was killed during the Siege of Ascalon (January 25th to August 22nd, 1153). After the Siege was finished, Montbard was elected as Grand Master of the order. It is rumored that he only accepted the nomination to Grand Master to block the election of Guillaume de Chanaleilles who was a favorite of King Louis VII of France. He served only for three years and left no lasting fingerprint on the office of Grand Master; other than being the last of the founding knights. 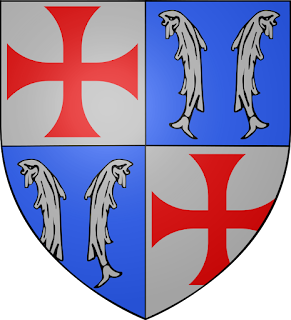 Montbard died on January 17th, 1156, in Jerusalem while in office and was succeeded by Bertrand de Blanchefort.